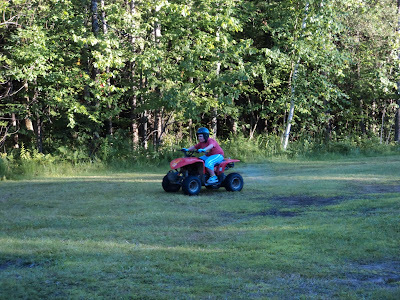 Riding an ATV on his own at camp this summer was a thrill for Ben. So I wasn't surprised when a message came home from his co-op placement that he'd made a beeline for an electric golf cart that students aren't allowed to drive. Ben is doing a co-op at Variety Village, a sports club adapted for people with disabilities. He goes every other day with an assistant. They're still figuring out his program but the other day he was in charge of taking membership cards and handing out basketballs. Apparently a new electric golf cart showed up in the sports equipment room and Ben thought it would be the perfect ride. But that's not in the student job description.